Is it you that I miss and your innocent love or the freedom that I left behind? 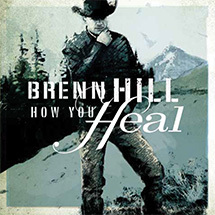 HOW YOU HEAL is the twelfth original studio album from Cowboy Singer/Songwriter Brenn Hill. Inspired by a life in and a love of the West, Hill continues to give great insight to the indomitable spirit of the Cowboy and the high and lonesome corners of the last American frontiers. “Modern-Day, Middle-Age Cowboy” is a tribute to the forty-something cowboys that are torn between the life they long to live and the obligations of a growing family. “Twenty and Cowboy” is a look back at the wonder and optimism that a young cowboy experiences as he hires on for his first job in the saddle. “The Highway To Nogales” is the story of a brave cowboy’s desperate plea to a Mexican Drug Lord and his odyssey through the Sonoran Desert. “Mono” gives insight to the depth and strength of the kinship between a cowboy and his working partner – the horse. “Knight On a White Horse” honors fatherhood and the integrity of family, while “Wolf Reaper” and “The Houndsman” give real insight to the men who spend their winters chasing the great predators of the West. HOW YOU HEAL is a recording that covers a broad range of themes, none more prominent than a pure love of the land. It is both a look back and forward from an artist that knows what it takes to survive, thrive, and find love in the rugged and beautiful mountains and plains of the American West. Order your CD today! There’s a set of corrals at the bottom of Otter Creek that’s full of calves in the Spring. The Weston Family invited me to the brandin’ pen just a few months after losing one of their own in a truck rollover accident. “A field of branded calves” meant a brand new start for a significant Utah ranching family. It was a day I’ll never forget. This one is spun from a book I read and the tales I’ve been told by ranchers and cowpokes on the Southern Arizona border. A Texas-raised puncher makes a brave delivery to save his family from a ruthless drug Lord. Think this never happened…? We sent our oldest son off to Deseret Land & Livestock for an adventure with the Hooper 3rd Ward. It was his first trip to the mountains by himself and on top of being a little nervous about it, a part of me really wanted to be there. This song takes a look back at when I was Twenty and Cowboy. These days, it takes a little more than a good mount to make me a helluva hand. The time I spend away from my family on the road is one thing, but to turn around and leave again the name of R&D is a hard sell sometimes. This one is a confession of sorts I guess. And may there always be another adventure. Always in my dreams I’m on a little brown and white paint. He’s older now and a little less prone to booger. The weather is always good and it’s just me and my old pard and there’s nothin’ to do but ride. The Dell is one of the last exits before the salt flats out on I-80. The range stretches far to the south below the old cedar mountain range. The corrals by the highway are a good place to brand. The blood moon phase sheds an eerie light across the valley. Quinn Stark has appeared in more than a couple of my tunes. He’s a former rough stock rider and all around good guy. I nominate him for Jr High School rodeo Dad of the century. My cousin and a couple of my closest friends spend a good chunk of their winters chasing mountain lions. This song commemorates some great times on the mountain looking for tracks and listening for the bay of an old hound dog. Bring on the winter. When ‘Little Isaac’ left for his mission, I asked him if he had a girlfriend. We were looking down over China Town into Toone Canyon. It was his last day in the saddle on the range before he left for Philadelphia. And the rest is history. With so much controversy surrounding the legal definition of the family, I set out with pen and guitar in hand to confirm my stance on this issue. My beautiful wife and family are the greatest gift God ever gave to me. When Briggs was “in-the-stuff” and on his back in the hospital, legendary cowboy and packer Ross Knox called about every other day to check on him. A few years down the road, after a bad wreck, I could hear a similar pain in Ross’s voice when I called to check on him. The ‘northern woods’ refers to the Selway-Bitterroot, the Kootenai, and the other mountain ranges of the west that have been wrongfully infested with a larger more aggressive Canadian Gray Wolf. Ranges that once were teeming with large ungulates are now quiet and empty as the packs enlarge and run deeper into the timber. But those who live there know the legend of one who rides to save the west.